Texas Lt. Gov. Dan Patrick in 2017. A top Texas conservative has been called away from his duties overseeing the opening of the state's legislative session for a meeting at the White House. Lt. Gov. 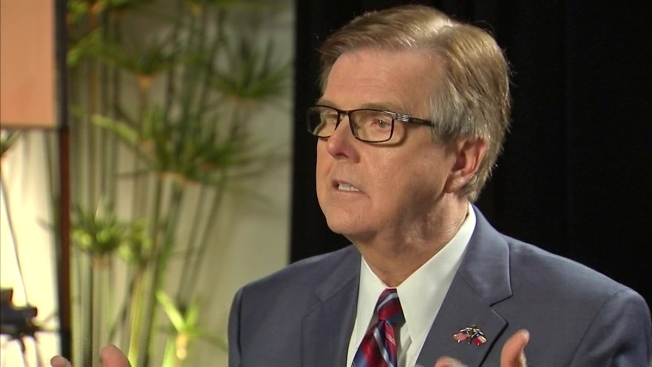 Dan Patrick headed Donald Trump's 2016 campaign in Texas and his trip to Washington comes as the president prepares to address the nation on the partial government shutdown sparked by a fight over funding for a U.S.-Mexico border wall. Republican state Sen. Jane Nelson opened the Texas Senate session in Patrick's place Tuesday and said he went to Washington for a meeting on issues "critical to Texas." Nelson didn't elaborate, saying only: "When the White House calls you to go to Washington, you go." Patrick has been one of Texas' top proponents of strict immigration and border security policies. Trump's address will air Tuesday night at 8 p.m. on NBC 5, followed by a response from the Democrats.